" Trick or Treat " chant . 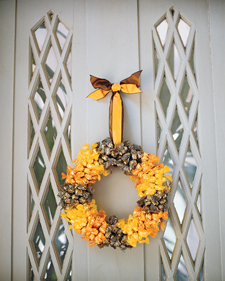 Martha Stewart has created the very ingenious Candy Wreath, made with 2 pounds of hard candy in twisted wrappers, an 8-foot length of embroidery thread, and a round and a round wire wreath form that is 8 inches in diameter. This is just one of the many creative crafts you can do that does not take too much effort-which is probably why I like it the most.